Who hasn't heard of the Irish mega band U2? I became a big fan of U2 after they released the song 'New Year's Day' in 1983. I must have played that song a million times when it came out, but not because of the drums, but mostly because of Adam Clayton's bass line, The Edge's signature piano line and guitar work, and Bono's amazing vocal melody within that song. I am a huge fan of songs & melodies and bands & singer/songwriters that have something to say and express with their words and music, and U2 fits right in that category. 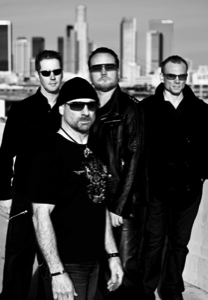 That's why I decided to dedicate this page of my website to U2 and L.A.vation - The World's Greatest Tribute to U2. 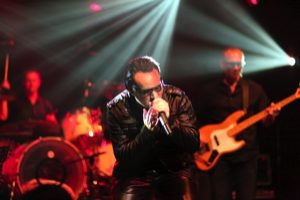 L.A.vation is a Los Angeles based U2 Tribute band that I partly founded and manage with business partner Bart Davis. It is a band in which I fulfill the role of Larry Mullen Jr. (U2's drummer), and in which I create, compose and program all the backing tracks, just like U2 uses them on their records and live shows. I guess you could call me Terry Lawless, the man under the stage, as well. I have played U2's songs in many countries, all over the world, in front of many people, languages & cultures, and everywhere we play, the audience knows these songs inside out, and they sing along. This Irish rock quartet has made quite an impact in the world and it amazes me every time again. Larry Mullen Jr., in my humble opinion, is a very understated drummer within the typical 'drummer community'. No, he is not Vinnie Colaiuta or Terry Bozzio, but who truly cares? Larry Mullen Jr. brings the right parts and the right feel and sound to all of U2's songs every time again, and his drum parts and musical approach are true to the songs in which they are played! To me, he is a true musician and one heck of a drummer! When I started this U2 Tribute journey, I showed up for the first rehearsal, and thought that I knew all the songs already. Well, I did....I knew the SONGS.... I could sing along with Bono's lyrics and melodies, but came quickly to the conclusion that I had NO idea what EXACT drum part Larry Mullen Jr. was playing within those songs. So, I went back to the drawing board, and started transcribing all his drum parts and practiced my behind off! Although Larry Mullen Jr. plays Yamaha drums and Paiste cymbals, I stuck with my own drum- and cymbal brand. I endorse Noble & Cooley drums, and asked them if they could build me an identical 'U2-Larry Mullen Jr.' kit, and they did. What a fine sounding and looking drum set it is! 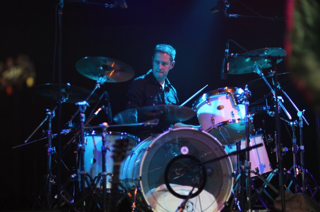 The kit is a Noble & Cooley CD Maple series drum set in White Sparkle, and in the exact sizes as Larry Mullen Jr. used during the 2001 'Elevation Tour' and the 2005/2006 'Vertigo Tour'. The drum heads are REMO Pinstripes on the batter side and REMO clear Ambassadors on the resonant side. The cymbals, well, I LOVE my Zildjian cymbals, and I'll keep playing those for a while. Larry uses Brady and Ludwig 'Black Beauty' snare drums and I do bring those to our shows. Lanois' production is recognizable and notable for its 'big' and 'live' drum sound, atmospheric guitars and ambiant reverb. Rolling Stone Magazine called Lanois the most important record producer to emerge in the Eighties. 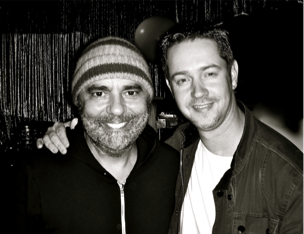 In 2010 I saw 'Black Dub' in concert at 'Spaceland' in Los Angeles, and met Daniel Lanois after the show. For me, a little dream come true. I would be beyond honored to be able to work with this amazing musician some day. Please visit www.u2.com to find out more about U2, www.u2lavation.com for more information on L.A.vation, the incredible and the world's best U2 Tribute band, and www.daniellanois.com to find out more about Daniel Lanois.